Mothers Fighting For Justice is peer support group for families impacted by gun violence in South Miami-Dade. 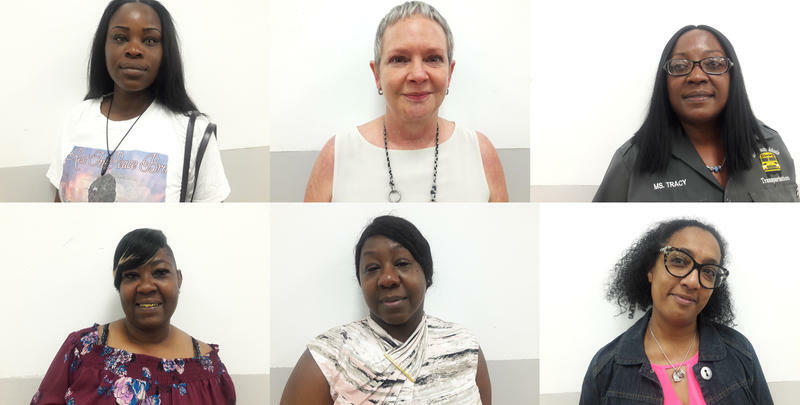 They call themselves “Mothers Fighting For Justice.” But it’s not just moms—siblings, girlfriends and close friends are also here. They meet in a community room at Gould’s Park in South Miami-Dade. There are about a dozen women sitting around two tables; each of them reflecting on a loved one lost to gun violence. Jackie Murphy-Walker is first to share her story. “I avoid talking about the situation,” she says. Three years ago, her daughter Samantha Murphy, 27, was caught in the crossfire of a shooting at a nearby club. Samantha had a daughter who Murphy-Walker adopted and is now raising. The little girl is five now. "She asks all the time, ‘Are you going to die like mommy?’" says Murphy-Walker through tears. "Imagine, what do you say?" In parts of South-Miami Dade where gun violence is rampant, some families have lost multiple family members and close friends to gunfire. The families, mostly from Goulds, Cutler Bay, Perrine and Homestead, describe being re-traumatized every time another shooting happens. There is very little mental health support within the community to cope with the constant violence. There are no therapy dogs dispatched after neighborhood shootings and counselors don’t set up in these communities for free to offer their services. It’s why Romainia Dukes started this small peer support group for families in the area. “We can help each other heal,” says Dukes, whose son DeMichael Dukes was killed four years ago. In this room, the families have space to talk about their feelings with people who are living the same loss. Murphy-Walker describes crying at random moments in the elevator at Jackson Memorial Hospital where she works as a social worker. Going to work everyday is an especially painful reminder because that’s also where her daughter died. Rhonda Mckenzie just met Murphy-Walker, but she tells her she remembers hearing about Samantha’s death on the news and in the neighborhood. “When it was your daughter I was praying so hard for you all,” McKenzie says. McKenzie says anytime there’s a shooting in South Dade, she relives her son’s killing, which remains unsolved. That's a familiar story among most of the women, who say they have a lot of pain and no justice. Five years ago, Antoine McKenzie, 22, was shot dead outside the Arthur Mays Villas public housing community just across the street from this building. The villas, better known to locals as “Chocolate City,” is dotted with clusters of teddy bears and 'rest in peace' shirts, makeshift memorials for the people who were killed there. “I avoid counseling and everything because it’s just hard to deal with,” says McKenzie. McKenzie has known about this group for awhile now, but this is the first time she felt strong enough to come. “I thought that maybe it would help me heal a little to see what everybody else is going through,” she says. Romainia Dukes says this is why she started this gun violence support group. During most meetings she acts as a facilitator. She’ll say her son’s name and that he was killed, and then she gives others room to speak. Today, she tells the group she’s going to open up more about her personal struggle. Dukes was inside her Cutler Bay apartment frying chicken for dinner when she heard the gunshots. Then, she saw her son’s body. “I was only like 10 steps away from where my son got shot,” she says. After his funeral, she tried getting therapy. Dukes says she has Medicaid but the waiting list to see a therapist after her first visit was months long. She gave up on that and turned to activism. 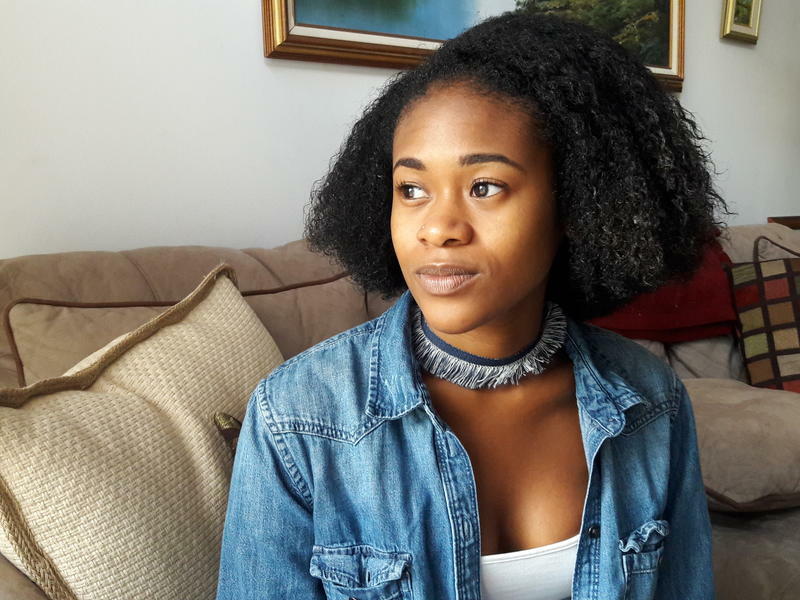 She led peace marches in Goulds and sponsors fun days for youth in the neighborhood to go to movies or eat ice cream. “They need to be exposed to more that just what’s happening in the neighborhood,” she says. Just hours before tonight's meeting, she was honored by the Miami-Dade Commission for her anti-violence work. “I love what I do, don’t get me wrong,” she says. But she says no amount of activism can make her whole again or take away what she describes as post traumatic stress disorder. When Dukes starts to cry, the other women comfort here. Maria Wright reaches over and rubs Duke’s arm. Wright lives in Pinecrest, in South Dade. It's not a neighborhood that experiences much gun violence. Her son Jerry Wright, 31, was killed in Orlando, at the Pulse Nightclub shooting. She was searching for people close by who understood the void she was feeling and she found it among the families here in Goulds. They welcomed her with open arms. Tracy Walker agrees, “Honestly we are a family because we’re going through the same situation." As the meeting nears its end Romainia Dukes announces she has a surprise. She hands each woman a plastic wrapped square. A pillow with a photo of the loved one they lost to gun violence. Megan Hobson was 16 years old when she was caught in the crossfire of a drive-by shooting in Miami Gardens. 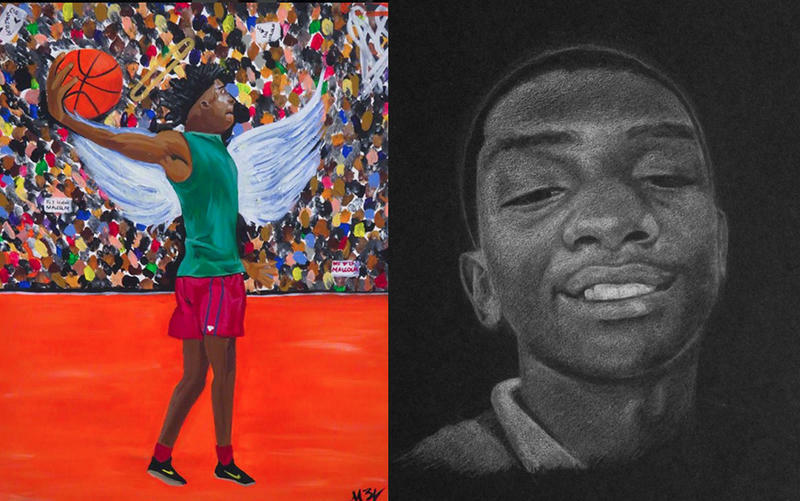 Two Miami artists are creating a visual archive of the toll gun violence takes by drawing portraits of people whose lives ended abruptly by bullets. Chire Regans and Markeven Williams embarked on their individual projects around the same time, but they didn't know each other. Regan, a teaching artist at the Perez Art Museum, and Williams, a corrections officer, both say they were moved by the killing of six-year old King Carter in 2016. King was going to buy candy outside of his North Miami-Dade home when he was shot. 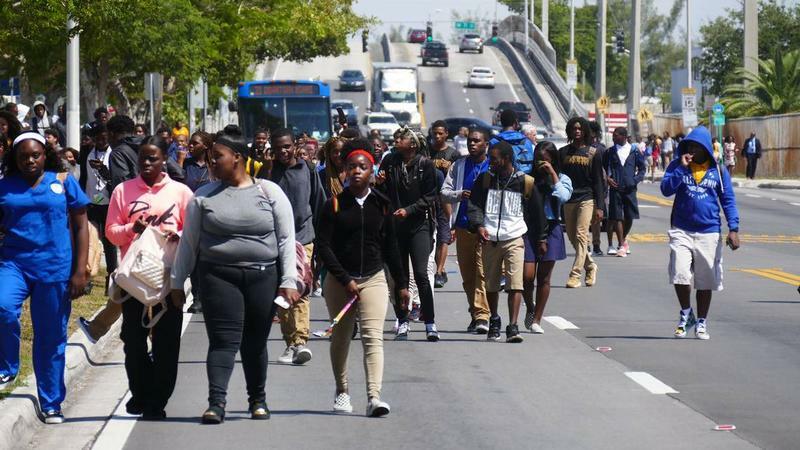 Hundreds of Miami Northwestern students walked out of class on Tuesday — a day after an on-campus tribute was held in memory of 17-year-old Kimson Green, who was shot and killed at a Liberty Square Housing Project on Sunday.